How does a church begin as an accidental church plant? If the Kingdom of God were to come to your town, would it look like your church? Is a church a church until they hold their first worship service? How does a church formalize a public witness as the body of Christ gathered? What is our discipleship model? Does it work? – Core questions for every church according to Dallas Willard. What are the character and competencies of Jesus that are transferrable to every member of your church? Here is one church’s approach. The Five Fold Skills of East End Fellowship – the core things that every church leader should know and do. Everybody says we need to make disciples, but in the end, are they just promoting another class or programmatic event? We must move into the marks of a growing disciple. We signed up for the revolution of the Kingdom of God, and somewhere along the way ended up running a church. Just ask Doug. Very few people have experienced life on life disciple-making, much less most of our church leaders. Here’s why. What prompted your pastoral calling to begin with? Was it running more programs or reaching and discipling more people? Are your people taking spiritual responsibility for being and making disciples? These are. What if your church “normal” was everyone growing in a disciple-making relationship? How do leaders move out of a programmatic cycle of ministry administration and into a disciple-making rhythm of growth? What would happen if your church members did what Jesus said to do? As it turns out, Jesus is the best disciple maker who ever lived. If a church is thriving and flourishing, it is always through a team more than one leader. What happens when the mission of your church moves from being run as an organization to being owned by every member? Are we about the image of God in everyone or just in those who are most comfortable for us to reach? Saying no to a lot of what you used to say yes to improves missional effectiveness and fights volunteer burnout. How do you contextualize the mission of God in your neighborhood? Here’s how one church does it. What is the most natural next step for your community to become a part of the body of Christ? Is it necessarily attending a service on Sunday morning? What are the most effective ministry vehicles to carry your vision? Do you care more about Justice or Jesus? How the missional movement can seem to be sidetracked. How do you live in the tension of the whole of the Gospel? Fight for being as passionate about personal holiness as we are communal holiness. Be as moved about your sins as you are societies ills. Are we as moved to comment about our sin as much as we do government and community? Are you a church in reaction to something or conviction of something? Here’s the difference. If we are looking at what the next generation will wrestle with in the gospel… it will be between social justice and personal conviction. What does a diverse, urban church ministry to reaching the millennial generation look like? What if everything that you do in ministry up until age 55 was training for ministry from ages 55 to 75? Stop leading ministry as if you have something to prove and instead becoming living proof of the gospel. Are you sharing the good news of Jesus or the good behavior of a church member? Discipleship is not an option… it is central to the good news of Jesus. 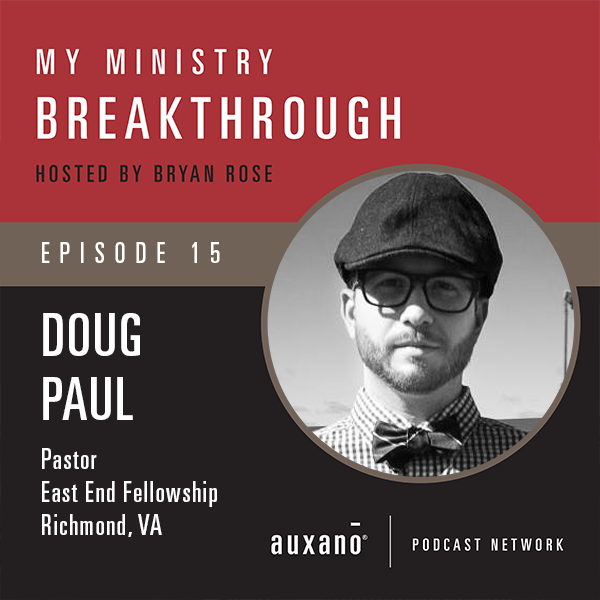 Doug currently helps pastor a team-led church in the inner city of Richmond, VA. He’s the former Global Strategy Director for 3DM, has planted a multiplying missional church, transitioned a mega-church, and was a Teaching Pastor and Multi-Site Director at a multi-site mega church. Additionally, he has come alongside a myriad of businesses, non-profits, and churches. Doug specializes in re-brands, creating savvy marketing execution and bringing strategic business innovation to increase disciple-making effectiveness. He’s married to Elizabeth, a C-Suite advertising & brand executive for MullenLowe US. They have three precocious and joy-filled kids: Avery, Jude and Sam. And quite recently, they brought a Great Dane puppy into the family!